Shock due to Increased Insulin Effect, or Insulin Shock, is a condition in which there is a surge in insulin levels, which leads to dangerously low blood sugar levels. What is Shock due to Increased Insulin Effect? What are the Causes of Shock due to Increased Insulin Effect? 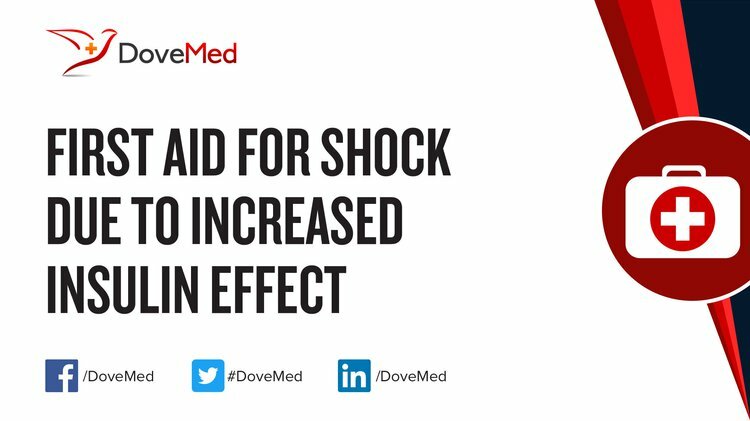 What are the Signs and Symptoms of Shock due to Increased Insulin Effect? In case of a delayed assistance, the individual may go into a shock or become unconscious. This can become a medical emergency. How is First Aid administered for Shock due to Increased Insulin Effect? Who should administer First Aid for Shock due to Increased Insulin Effect? If necessary, any bystander near the affected individual can assist in providing first aid. In case of an emergency, one should 911 (or the local emergency help number). What is the Prognosis of Shock due to Increased Insulin Effect? How can Shock due to Increased Insulin Effect be Prevented? NICE-Sugar Study Investigators. (2012). Hypoglycemia and risk of death in critically ill patients. N Engl J Med, 2012(367), 1108-1118. Battelino, T., Phillip, M., Bratina, N., Nimri, R., Oskarsson, P., & Bolinder, J. (2011). Effect of continuous glucose monitoring on hypoglycemia in type 1 diabetes. Diabetes care, 34(4), 795-800. McCoy, R. G., Van Houten, H. K., Ziegenfuss, J. Y., Shah, N. D., Wermers, R. A., & Smith, S. A. (2012). Increased mortality of patients with diabetes reporting severe hypoglycemia. Diabetes care, 35(9), 1897-1901. Holger, J. S., Stellpflug, S. J., Cole, J. B., Harris, C. R., & Engebretsen, K. M. (2011). High-dose insulin: a consecutive case series in toxin-induced cardiogenic shock. Clinical toxicology, 49(7), 653-658. Urban, M. J., Dobrowsky, R. T., & Blagg, B. S. (2012). Heat shock response and insulin-associated neurodegeneration. Trends in pharmacological sciences, 33(3), 129-137. Chen, X. L., Xia, Z. F., & Wei, H. F. (2011). Escharectomy and allografting during shock stage reduces insulin resistance induced by major burn. Journal of Burn Care & Research, 32(3), e59-e66. Zoungas, S., Patel, A., Chalmers, J., de Galan, B. E., Li, Q., Billot, L., ... & Grobbee, D. E. (2010). Severe hypoglycemia and risks of vascular events and death. New England Journal of Medicine, 363(15), 1410-1418. Munshi, M. N., Segal, A. R., Suhl, E., Staum, E., Desrochers, L., Sternthal, A., ... & Weinger, K. (2011). Frequent hypoglycemia among elderly patients with poor glycemic control. Archives of internal medicine, 171(4), 362-364.